Back when I first started knitting, I kept seeing "Slip the first stitch for a nice, finished edge". Well, I slipped the first stitch, but didn't see that it made any difference from when I didn't slip the first stitch. I couldn't figure out what all the fuss was over slipping the first stitch! One day, when I was just playing around trying to think of something to knit, I figured I'd give slipping that first stitch another whirl. This time, instead of slipping the stitch with the yarn in the back, I slipped it purlwise, with the yarn in front. As I continued to knit, I was amazed at the lovely, braided edge I had. All that time I had been slipping the stitch knitwise. I could have been saved a lot of frustration had I been told how to slip the first stitch, not just "slip the first stitch". For some reason, the how is never included in instructions, at least not that I have ever seen. So, here are some pictures and videos on getting a nice clean edge on your knitting. Picture A shows the edges of a fabric that have not had the first stitch slipped. There really isn't anything wrong with this edge, it is just a matter of taste. If you like the bumpy edge, then don't slip the first stitch. Either of these methods will give you the lovely, twisted stitch (or braid as I like to call it) along the edges of your work. This is my favorite edge. I have also made a video demonstrating each of these methods. Picture B is a wash cloth I knit, and all edges are the same, including the cast on and bind off. To achieve this lovely border, in addition to slipping the first stitch, you will do the crochet cast on - this matches the standard knit bind off. Below are the videos of slipping stitches, and the Crochet Cast On. (And just a side note regarding this cast on - if you were to use waste yarn instead of a needle, this would give you a provisional cast on, in which the waste yarn would be removed at some point leaving you with live stitches. I have never utilized a provisional cast on because I am scared of having live stitches hanging around. I plan on overcoming this fear soon, and will post more on provisional cast ons and their uses as I learn about them.) In addition to creating a nice, neat edge, slipping the first stitch is immensely helpful if you will be picking up stitches along the edge, or sewing pieces of fabric together! I hope this has been helpful. Enjoy! The project I am doing I need to do stockinette stitches. Do I always slip the first stitch purlwise? Or on the rows that are supposed to be purled, do I slip the first stitch knitwise? Basically, I am asking if I switch between purlwise/knitwise slipping or if I stick to one type for the entire project. Thank you so much! Decide which method of slipping you want to use, and stick with it throughout, and you should have the nice edges regardless of what you are doing in between the edges. I am doing a blanket that requires a slipped stitch at the beginning of each row and I am trying to figure out if that means that the first slipped stitch counts as the first stitch in the pattern. So, if it says for row 2 to k2, p3, etc. - does the slipped stitch count as one of the first two knit stitches? Or would I slip and then k2? Because if I do that, then I don't have enough stitches with the amount I cast on as specified by the pattern. The pattern really should tell you if the slipped stitch is included in the stitch count or not. Since you say you don't have enough stitches to finish the row if you slip, then knit two, it doesn't sound like the slipped stitch is included with the stitch count. Personally, I would just cast on two extra stitches so that I could slip the first and knit the last for a neater edge. Hope this helps! Do you have a video on how to do a stockinette with making a nice edge like in this video? This is one of the better video's showing how to slip the first stitch. Do you have a video of doing a mattress stitch, I really enjoy your video's and style of presentation. No I do not, but I can make one for you. I will try to get it posted this weekend. My pattern is for a bordered scarf. You are supposed to crochet cast on 20 pegs, then row 1 says slip peg 20, knit to end of row. I'm really confused. Can you please help and thank you in advance. Pegs? Are you working on a loom? I'm sorry but I can't help with that because I do not use a knitting loom. You may want to ask around on knittinghelp.com or Knitting Paradise. Thanks so much for this very helpful video! Really clear, thank you for your explanation. 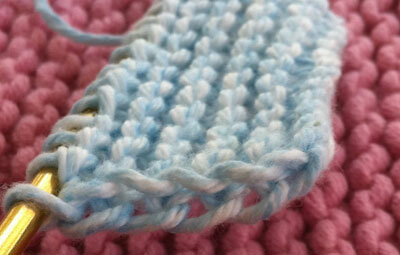 Help me with my confuse while slipping the 1st knit wise but not purl the last, did not come out as the expected edge. This is EXACTLY what I was looking for. I love it that you give the three different versions -- different patterns have given me different ways to do this and then when I try to do it on my own inevitably I combine instructions and can't figure out how to adjust! I'm bookmarking this -- thanks.